​This workshop at Colorest is a unique opportunity to learn a skill that is traditionally passed down by the Matriarch of the family to their children in Ukraine. Pysanky, also known as Ukrainian eggs, is a folk tradition that is both art and prayer. 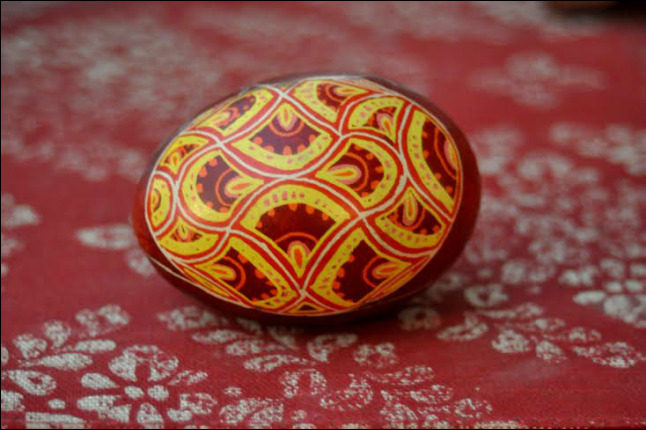 The method is similar to batik - patterns are drawn on the egg with hot beeswax, which then protects the covered areas from the dye that is applied. By repeating this process with different colors of dye, a multi-colored pattern is built up. Finally, the wax is removed to reveal the colors that were covered up at each stage. The finished product, with its intricate designs and symbols, does not suggest the meditative process involved. A great deal of patience and concentration is required to complete a single egg, but it is very rewarding to reveal your hard work when the wax is taken off. All skill levels and ages can create an original pysanka. You will leave with a beautiful egg at the end of the session. Jennifer is a high school art teacher in Tinton Falls, and exhibits her decorative eggs and embroidery in the tri-state area. She has been teaching pysanky for several years in various settings, including the Chapel of Sacred Mirrors in New York State.